DeeDee Catpiss & The Fuzz Coffins. Photo by Aaron Rhodes. Announced less than two weeks before it arrived, Hattiesburg, Mississippi punks DeeDee Catpiss & The Fuzz Coffins played their second Kansas City gig of the year on July 6. Those without a Maximum Rocknroll subscription may not know it, but the Hattiesburg scene is currently a veritable hotbed for off-the-wall punk bands. 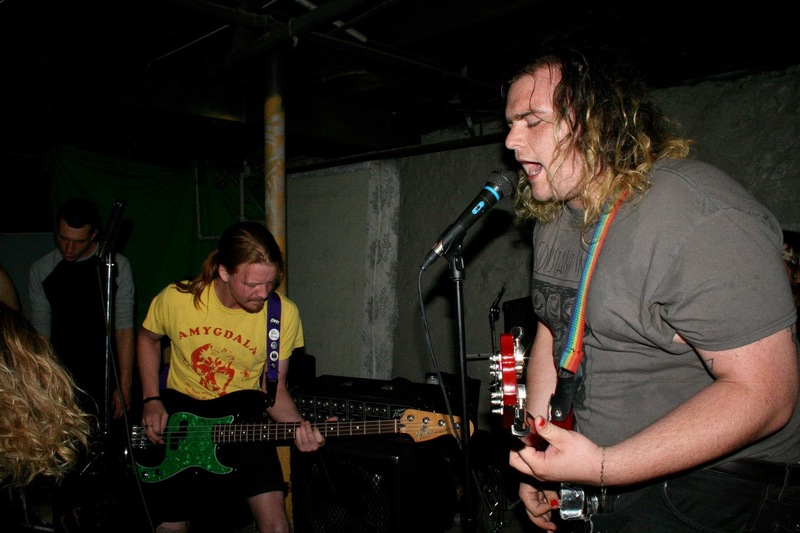 DeeDee and their Coffins shredded through a short set of bite-sized garage punk tunes that gleefully contrasted their witty, cartoonish sound with the more intense punk topics of hating both cops and landlords. DeeDee also threw in a few mini-solos for good measure. St. Louis trio Waterproof opened the show with an even shorter set, combining pop charm and wiry, Minutemen-esque tones. Unforgiven Five closed out the show, fiery and calculated as ever. All in all, only a couple dozen made it out and the show took place in less than 90 minutes, but a fun and intimate 90 minutes it was nonetheless.